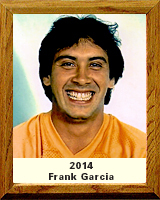 Frank Garcia’s career, both educational and athletic began at Salpointe High School, where he graduated in 1975. While there, Garcia lettered in football and basketball for 3 years and baseball for 2 years. Football was the sport in which he excelled. In 1974 Garcia was selected to the All-City (1st Team) Football Team by both the Arizona Daily Star and the Tucson Citizen (co captain). He also participated in the 1975 All-Star Football Game and was selected to the 1974 All-State Football 1st Team for the Arizona Republic and the Arizona Daily Star. Twenty years later Garcia was inducted into Salpointe’s Sports Hall of Fame. He graduated from the University of Arizona in 1981 with a Bachelor’s degree in Education. Garcia was the punter for the University of Arizona football team and tied for first in the PAC-10 in 1978. In 1981 he punted in one game with the Seattle Seahawks, and in the spring of 1983 he punted in three games with the USFL Chicago Blitz. Finally in 1983, as an undrafted punter, he got his big break and was signed by the Tampa Bay Buccaneers where he remained until 1987. While with Tampa Bay Garcia received the Mackey Award for the NFC leading punter and was an All-Pro selection in 1983. Once his football career was over Garcia concentrated on his educational degree and began teaching at Kofa High School in Yuma, Arizona in 1990. He continued to teach for nine years while at the same time earning his Masters degree in education. He received this degree in 1996 and began his career in administration in 1999 and has enjoyed it for the past sixteen years.